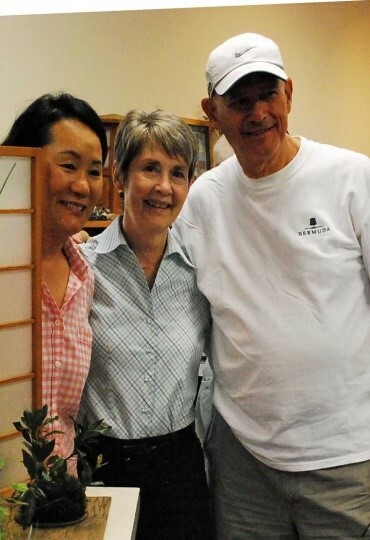 A little over a month ago, the Susquehanna Bonsai Club had the honor of receiving an excellent demo/lecture from 2 extremely well-known bonsai professionals. From the UK, Peter Warren teamed up with Minoru Akiyama from Japan and gave our club a great show. Minoru Akiyama apprenticed for six years under bonsai master Kunio Kobayashi at Shunka-en bonsai nursery. At age 29, Minoru was the youngest person ever to win the Prime Minister’s award at the Sakafu-ten bonsai exhibition, the highest accolade for a professional bonsai artist. 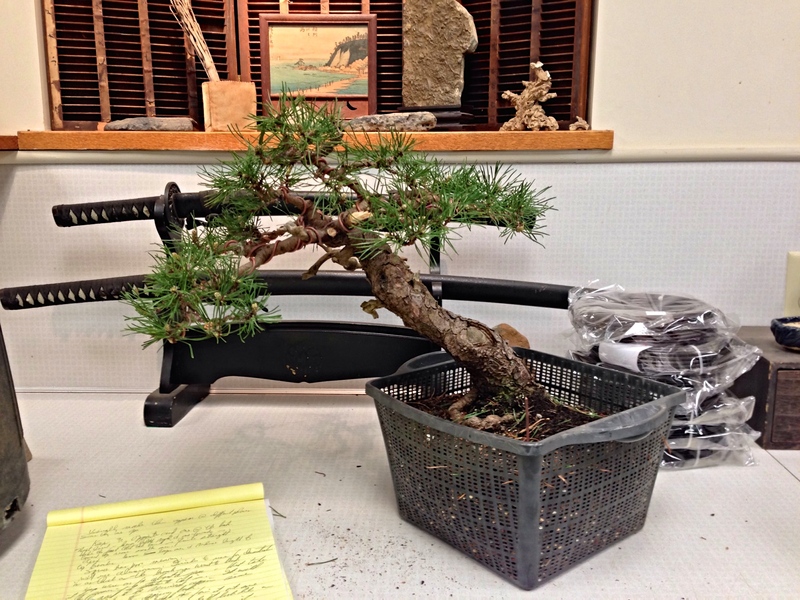 He won this award again in 2011, both times using junipers collected by his father, a renowned yamadori collector. He has won many other awards at Sakafu-ten and won the top prize at Koju-ten, the professional Satsuki Azalea exhibition. Peter Warren did a 5 year apprenticeship under bonsai master Kunio Kobayashi at Shunka-en as well. It was during this time Peter met Minoru and they became good friends while both were apprentices. Peter has a wealth of bonsai knowledge and travels the world giving bonsai demos/lectures to bonsai clubs. Minoru was the Senior apprentice (Senpai) while Peter was the Junior apprentice (Kohari). 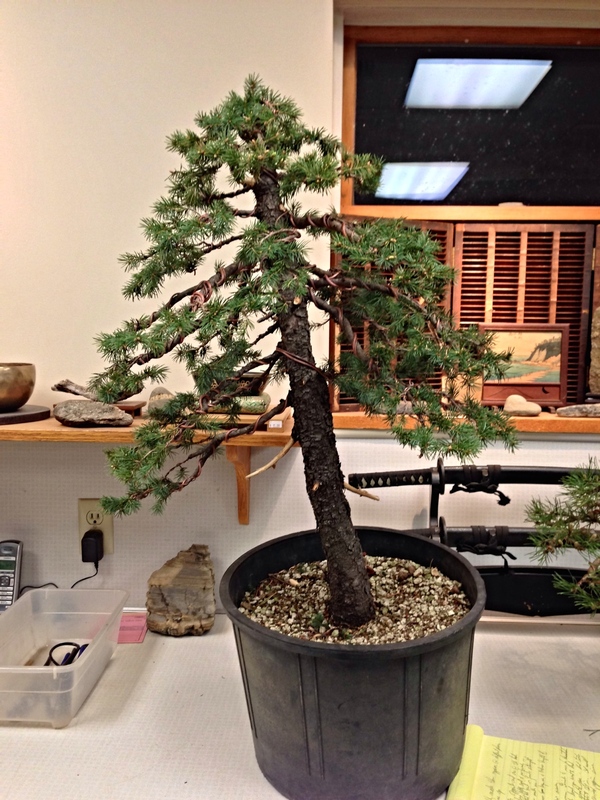 For our club demo, an established root-over-rock shimpaku juniper was chosen for them to work on. Majority of the hands on work to the tree was done by Minoru while Peter did all the translating and assisting when needed. Also while Minoru was working on the tree and Peter had some free time, Peter gave the club some great info on care, styling and techniques for working with junipers. All and all it was a great club meeting! 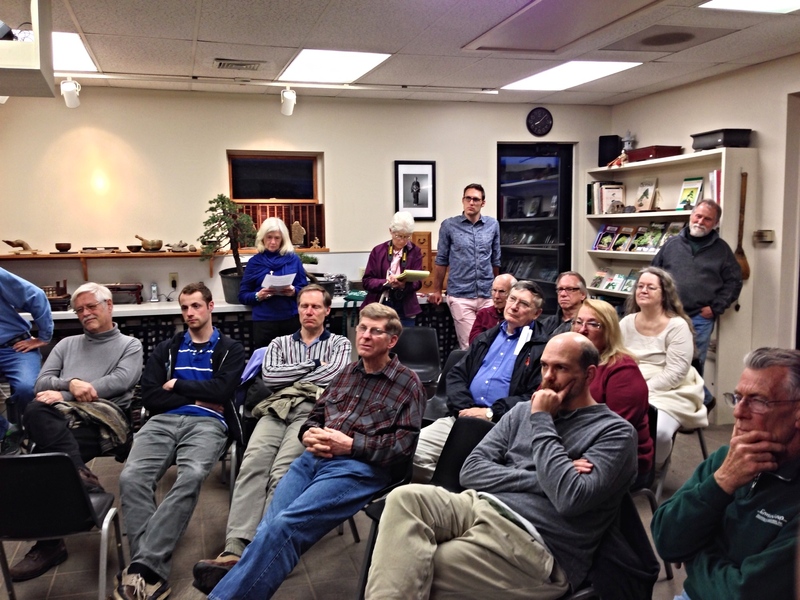 After the photo gallery is more detail about the demo/lecture provided from our club’s newsletter editor Ross Adams. Both artist looking over the demo tree. For this demo Minoru did most of the work with Peter translating and assisting when needed. Minoru looking at tree to get an idea of the design. Minoru and Peter still contemplating on a design. And then Minoru and Peter step back to still think design. Checking on what branches to keep and what ones to go. And then the work on the tree starts again……. Looks like he’s performing surgery on this bonsai! Dont cry Peter! Minoru is almost finished wiring. Trees with a less than ideal nebari are generally used for root-over rock plantings. It is important to find a good rock to put the tree on since the image and feel of the tree will be influenced by the rock. A deciduous tree can be placed on a rock with soft curves, but if you are working with a conifer, you want a mountainous image of the stone. Stones like trees have a front and back. Since junipers grow in a severe environment, look for a stone with a severe mountainous image. The Root-Over-Rock Juniperus chinensis ‘Shimpaku’ has tight foliage and many branches. It suggests a cascade, semi-cascade, or windswept style. Semi-cascade and windswept are similar but made by different forces. Semi-cascade and cascade have the image of clinging on a rock and being pushed down by rocks and snow, whereas windswept is created by winds blowing and forcing the branches to survive on the leeward side of the tree. One of the difficulties of changing the angle of a Root-Over-Rock style of tree is how deep is the rock in the pot? If the rock is shallow, it can sometimes be corrected by creating a stable base for the rock with cement if it will be concealed at ground level at the chosen angle. Peter and Minoru decided to create an image of a plant growing in a severe environment, the tree grew up and then got hit with winds that bent it over. Deadwood will be created and the main line of the composition will be determined. To create deadwood, look for branches that are straight and have no character and cut the stub long and use a cutting and tearing technique to simulate how a tree loses branches in nature being careful not to damage tissue below the branch. There are three branches all looking about the same for the main line. Remove the thicker branch, the two remaining branches are thinner and will improve the taper of the top. Leave more foliage on the branches until they are placed and then remove excess. The tips are left uncut, they will continue to grow and the tree will recover more quickly. In a month or two the longer shoots can be cut back. Look at the balance of the whole tree as well as the individual branch you are shaping. Re-pot next year if the tree is growing well. When a tree loses foliage, it thinks it is going to die and sends out juvenile foliage. Juvenile foliage has more surface area and synthesizes more and is soft and breathes more easily. Cutting too many roots, pruning back too hard, or taking off too many growth shoots all can cause the growth of juvenile foliage. Junipers grow rapidly. Light green tips indicate growing tips, inside the tree needles are waiting in reserve and the tips are darker green, while failing areas turn brown. Clean out the dead and dying foliage from inside the tree to bring in air and light and encourage back budding. Clean off the base of the branches and prune back the terminal growth cut back the growing tip to encourage the secondary branches of the cluster to grow. Cleaning everything out from the crotch is bad and leaving everything is bad, rather encourage adventitious buds to grow so we can cut off “leggie” branches. Select one juvenile growth to replace “leggie” branches. Rather than cutting off a long shoot, wire the branch and bend it on two planes, bend it up, right, down, left. A pad should look like an upturned hand with fingers extended up creating depth and more movement to the pad. A long shoot can develop a nice pad in one year using this technique. Don’t tie shoots in knots or a pig tail. Prune off all branches that are on the inside of curves. Secondary branches grow on the outside of the curves. It is best to wire and style trees in the fall when the growth is hardened off. The branches are more supple in the spring, but more care is required in the spring to prevent damage to the bark. Once we get tight growth and the strength of the areas are relatively equal, maintain the fan shape of the branches. Look for strong areas to cut back by removing the strong central growing tip of bundles and allowing plenty of green tips to grow. It is no longer standard practice to pinch all growing tips which actually causes the tree to go in shock. Disease problems with junipers include spider mites, scale, and tip blight (more a problem on the West coast). Preventive spraying of pesticides is good if you are having problems. Spray from the inside out and repeat in a week or follow label directions. Mites mature and are laying eggs in a week. Spider mites like dry conditions spray from a hose will help dislodge mites. We are close to the mountains and have to consider contamination from the wild. Fungal issues are caused by humans not sterilizing hands and tools, rain or spray late in the day, and cedar apple rust from crabapple and rose family and hawthorn, and tip blight. Junipers will not transmit rust to each other but Prunus and Malus are alternate hosts for rust. Thanks for viewing! If you liked this post, please feel free to follow the Susquehanna Bonsai Club’s blog to keep up-to-date with all our club events. Categories: Guest Bonsai Artist, Minoru Akiyama, Peter Warren | Tags: bonsai, bonsai club, bonsai demo, bonsai trees, Minoru Akiyama, Pennsylvania, Peter Warren, Susquehanna Bonsai Club | Permalink. Corin and his brother Paul are the second generation owners of the Greenwood Bonsai Studio located on the edge of Sherwood Forest. Their father Harry Tomlinson, who passed away in March, began the business in 1978. By the looks of it, we had a good club turn out for the demo! Corin presented a slide show of the nursery and specimen trees they have styled. Go to their website, www.bonsai.co.uk to view some of the specimen trees. For the demonstration, Corin chose to work on a dwarf spruce, Picea jezoensis ‘JD’s Dwarf’. This tree’s history starts in 1984 when Jim Doyle brought a potted specimen of Picea jezoensis back from Japan and planted it in his garden, intending to style it in a few years after its roots developed. Years later, still in Jim’s garden, the tree caught the attention of nurseryman Greg Gulden. Greg decided to graft this dwarf exotic specimen from an obscure region of Japan and name it after Jim. ‘JD’s Dwarf’ characteristically starts out as a low spreader for about six years and then develops a dominant leader and eventually takes on a nearly perfect pyramidal form. Corin commented that the spruce has a lot of branches that are long, the trunk is quite straight, a lot of branches are radiating from certain areas and the specimen was grafted low. Corin styled a fairly formal tree. He chose the front of the tree with the roots going right and left, and cut off a few crossing roots. Next, he examined the branches and removed a heavy branch from the back and other smaller branches that did not add to the design. He scored the jin and remove the bark, but left it long and will do the carving and styling of it later when the wood dries out a bit. Also, some of the jin can be removed later if it does not add to the composition. On the lowest level, Corin kept three branches, 2 opposite and one to the back. On the next level he kept a left and right branch and one toward us (the front). Finally, he removed the larger branch of the apex and reduced the length of the top branches. Corin said that spruce are quite flexible, so the remaining branches were brought down to fill in the bare spots and disguise the fact that the trunk is quite straight. He used aluminum wire since it works a bit faster than copper for demonstration purposes. His recommendation is to generally use wire that is ½ the thickness of the branch you want to bend. Corin kept us entertained with anecdotes from his bonsai world while he wired the tree. He recommended keeping the wire on for a year, but take it off sooner if the wire begins to cut into the bark. The tree will probably have to be rewired again after the wire is taken off since spruce have poor memory. At that point he suggested bringing the branches down to make it look like an alpine spruce with a snow weight on the branches. Also, put movement in the branches, and fan it out some. Keep the plant in the pot for this year and re-pot it next Spring. Since the roots are exposed above ground, he recommended using some rocks to make the base more appealing. 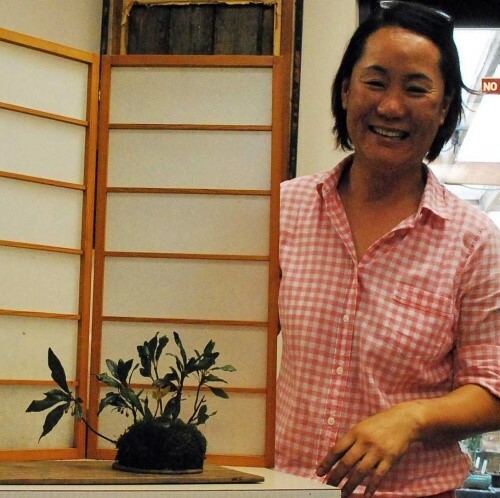 Also prior to the demo, Corin styled the below 2 bonsai while at Natures Way Bonsai Nursery. Congratulations to Norma Brandon on winning this beautiful JD Dwarf Spruce that was raffled off after the demo! Thanks for viewing the Susquehanna Bonsai Clubs blog. If you are relatively close to Harrisburg – York – Lancaster areas, please come out to a club event and if you like what you see please join us!! Categories: Corin Tomlinson, Guest Bonsai Artist | Tags: bonsai, bonsai club, bonsai demo, bonsai trees, Corin Tomlinson, Pennsylvania, Susquehanna Bonsai Club | Permalink. 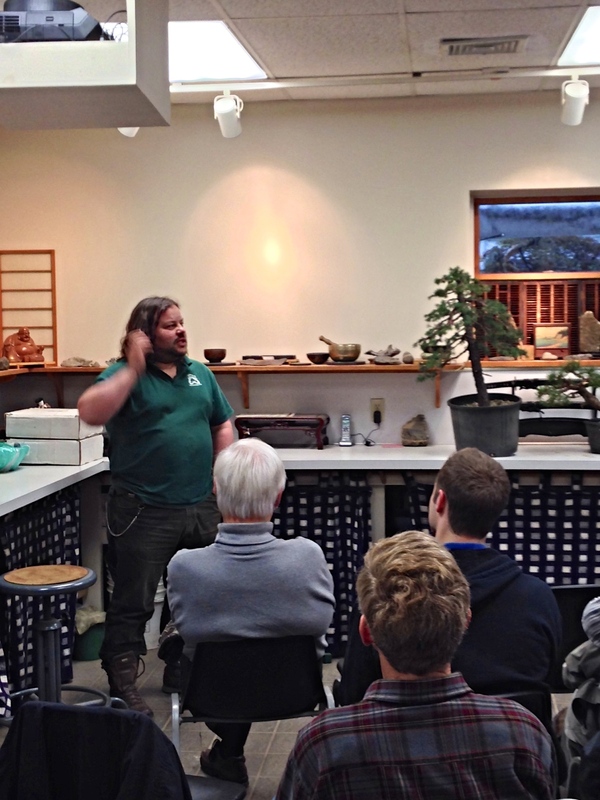 The Susquehanna Bonsai Club was given the pleasure to have Owen Reich as a guest speaker. Owen has vast knowledge about bonsai and kusamono, a lot of which he gained while doing an apprenticeship at bonsai nursery Kouka-en which is owned by famous bonsai master Keiichi Fujikawa. Owen’s “twofer” presentation gave us a brief re-potting demo using a beautiful NWS [tree?] but primarily focused on kusamono from the Japanese aesthetic perspective, then treated us to a brief re-potting demo using a beautiful hornbeam. Owen shared that kusamono was initiated in the Kyoto area using local native plants and is now practiced as a “side art” and that there are three basic types of kusamono: moss balls as companion plants, or accents, for bonsai display; seasonal arrangements that are put together in recognition of the current or upcoming season, and stand-alone kusamono that are displayed alone in a similar fashion to bonsai. 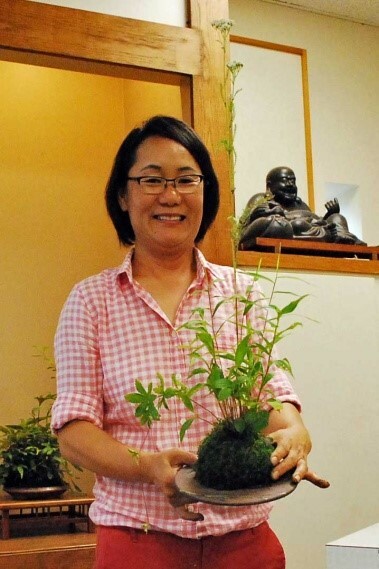 Two major points of difference Owen observes between U.S. and current Japanese kusamono are that Japanese kusamono usually are much longer in training before display and kusamono as companion plants for bonsai are much smaller in Japan than in the US. 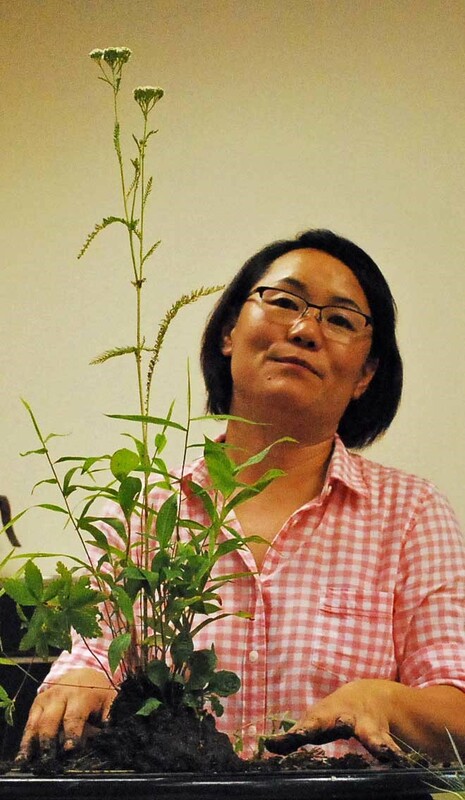 While seasonal arrangements may be put together and dissembled after an event or season has passed, the general approach in Japan is to plant an arrangement and train it via defoliation and allow it to mature for a few years before it is exhibited. In the past Japanese kusamono-as-accent plants were at least as large as those most commonly seen in the US but the current Japanese vogue is for them to be no more than an inch or two in size, if not smaller! Owen said that as much plant material as possible is stuffed into a container and that which survives over time creates a very attractive display. Owen said that many of the general design considerations of bonsai also apply to kusamono such as considering compliment and contrast between the material and the container. He said it is important to know the environment different plants thrive in so everything in a combined planting is healthy. His final observation was that success will come from studying and learning the Japanese methods first, then stepping out and doing your own thing. Owen’s pointers on re-potting focused on root treatment and tree placement. His main emphasis was on the need to make sure large non-feed roots are removed and the remaining feeder roots are groomed to be radiating out from the trunk. Categories: Guest Bonsai Artist, Owen Reich | Tags: bonsai, bonsai club, bonsai demo, bonsai repotting, bonsai trees, kusamono, Owen Reich, Susquehanna Bonsai Club | Permalink. 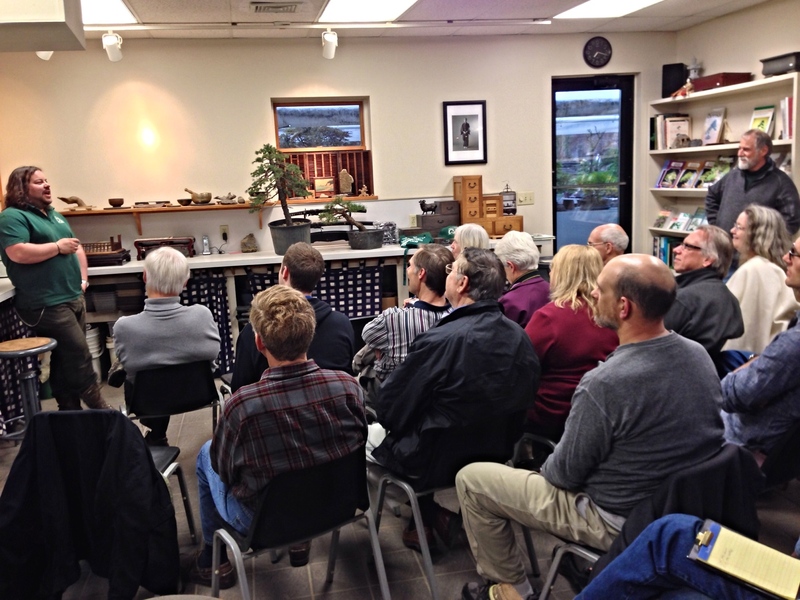 On Thursday, February 27, 2014, we had another club meeting with world-renowned bonsai artist Bill Valavanis. Bill gave us an incredible lecture/demo regarding how to make a proper bonsai forest planting. However, prior to the demo a couple of awards were handed out for the clubs display at this past falls Hershey Gardens Exhibit. 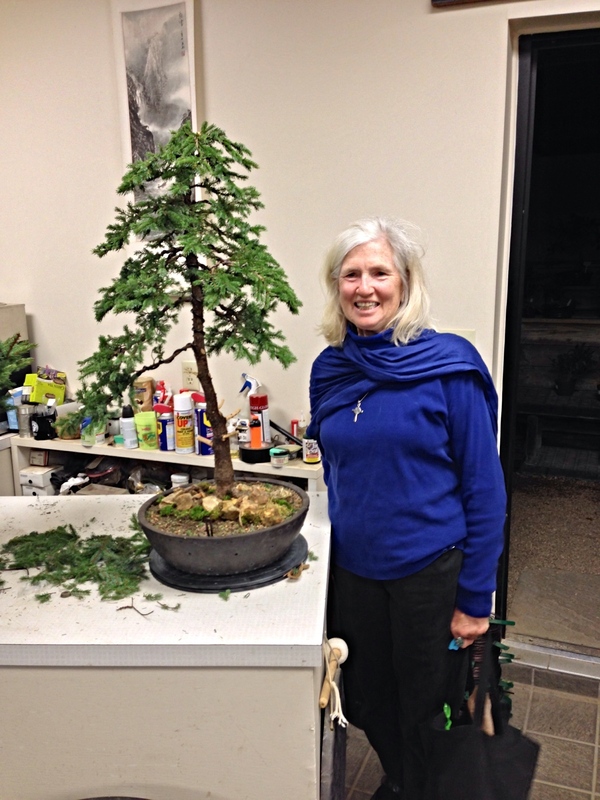 Susan Thomas was awarded First place for her root over rock Chinese Elm. Bill Valavanis spectating as the awards are handed out. Bill Valavanis took us deep into forest planting but also gave great overview information such as there are five different classifications of group plantings: Classical, Natural, Seasonal, Tray Landscape (Saikei), and Grass. Seasonal and Grass plantings frequently are created for a specific purpose then taken apart. Saikei or tray landscapes are intended to represent a scene in nature and are composed of many different trees as well as natural and/or man-made objects. TheClassical type adheres more closely to the traditional Japanese way of preparing and presenting trees. The Natural style more closely represents how the trees might be viewed in nature. Going a bit deeper into the forest, Bill explored the Single Root System and Multiple Root System approaches to Forest Bonsai. The single root system involves taking a single tree and laying it down and training at least five branches to grow as individual trees. After preparing the tree, including making some cuts on the trunk, it is placed in a growing box long enough and deep enough to cover the trunk with two inches of growing medium. New roots will start from the cut areas of the trunk in 1-2 years. 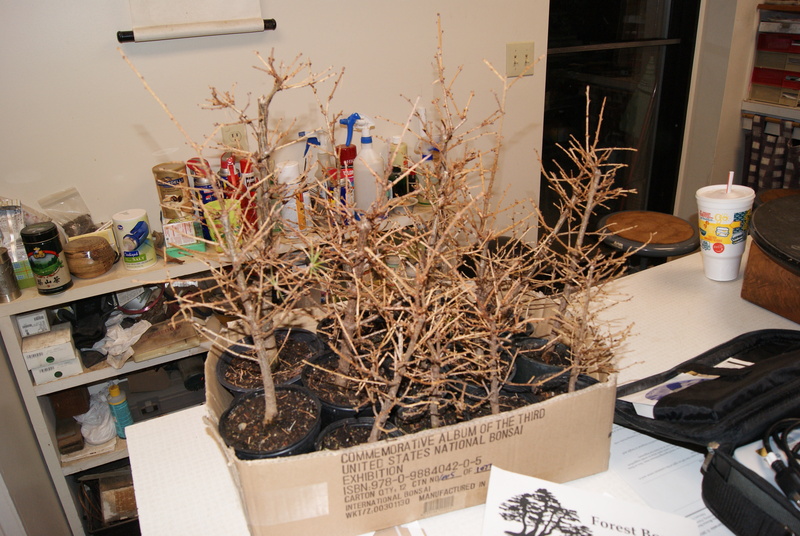 The Multiple Root System approach, which Bill used for his demonstration, is a forest planting composed of multiple seedlings or cuttings of different trees. Most frequently all the trees are of the same species in a forest planting but variations in color or growth habit across the trees can add an interesting effect. Bill also distinguished two styles of Single Root Forest Bonsai, the Raft Style and the Sinuous Style. The Raft Style is created from a relatively straight tree and does not have much depth of field since the individual trees will be in a straight line. In contrast,the Sinuous Style is created from a trunk which is not straight or is curved for the forest creation and the finished product will have a more natural feel and more depth of field since the trees will not be in a straight line. Design Factors to consider when creating a forest Bonsai include Focal Point and Eye Movement – whether the composition “moves” left to right or right to left; Composition and Spacing – plant on irregular lines from front and side views and use of varied spacing between trees; Trunk Thickness and Height – the main tree is highest and thickest and other trees should be irregular in height and smaller in diameter; Trunk Lines — avoid crossing trunks in formal upright plantings; and Silhouette – wide triangular silhouettes create a definitive impression and usually fill most of the container while narrow and one-sided triangle silhouettes create a suggestive impression and usually large areas are left un-planted or filled with flat stones. Utilization of the design factors creates an Appearance of Forest Bonsai characterized by the following dichotomies: Near (tall trees in front) or Distant Vies (tall and heavier trees in the middle section); Realistic (use of stones, ferns and ground covers) or Idealistic (trunk placement emphasized by the bare essence of composition) feeling; and Definitive (vanishing point defined) or Suggestive (vanishing point created by the imagination) impression. 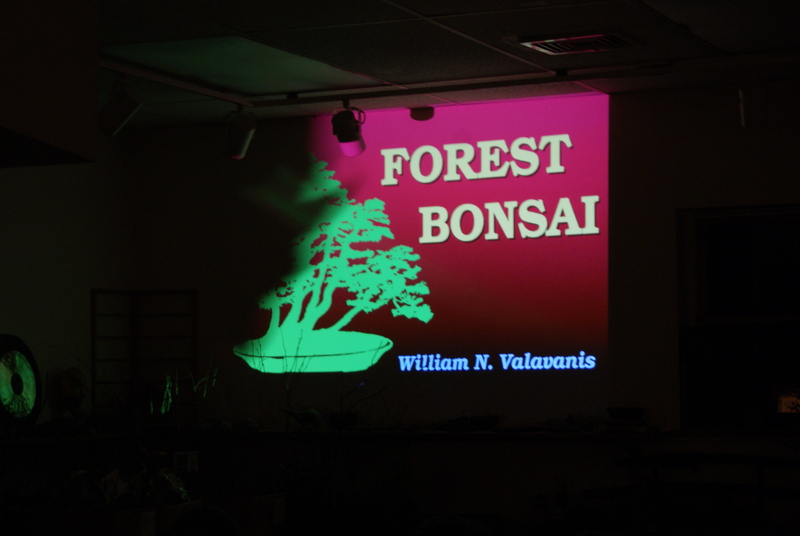 Bill’s slide show and commentary beautifully illustrated the design factors and appearance of Forest Bonsai. Bill used 2-3 year old Japanese Larch for his Forest Planting demonstration. The trees were grown in different size containers, causing variation in height and trunk girth. He chose a blue pot to show off the Spring and Fall colors of the Japanese Larch. For the assembly of Bill’s forest, the largest trees was placed in the pot first on a hill then two supporting trees were chosen and placed with the main tree. This grouping was placed on the left side of the pot, creating a left to right focal point flow from the heavier to the lighter concentration of trees. Bill then positioned an additional ten trees, starting with larger trees and working to the smaller ones. The placement of the trees resulted in an asymmetrical triangular outline. Bill suggested that if you are having trouble with the trees holding their position, use a heavier soil or put some water on the soil. Tie down the trees and remember to finish tightening the wires by adding a Z-twist to the tie down wires on the underside of the pot. Undesirable unneeded branches are removed, generally cut the heavier ones and leave the lighter branches. Do not soak the pot when you water, rather water the composition from the top and allow water to run through the pot. And, finally, if you are going to wire the trees, do it in the summer and wire all the trees. 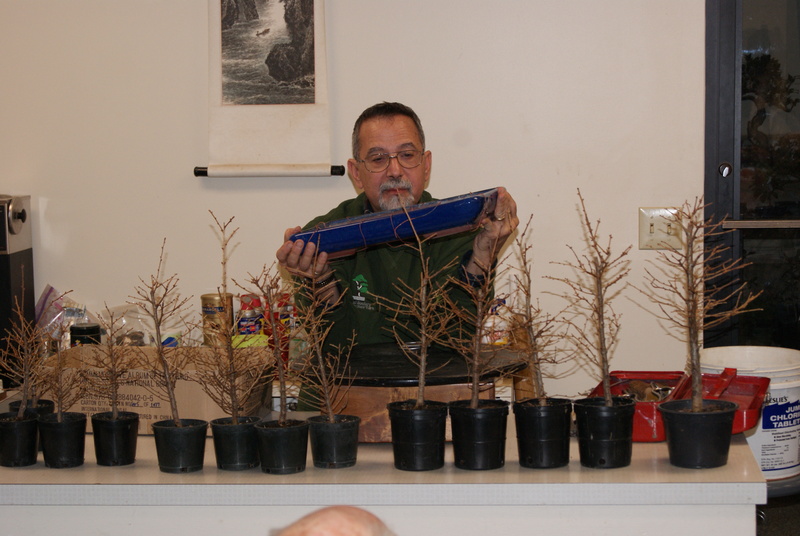 Please enjoy the following photos of Bill Valavanis’s demo of creating a bonsai forest planting. Categories: Bill Valavanis, Guest Bonsai Artist | Tags: Bill Valavanis, bonsai, bonsai club, bonsai demo, bonsai display, bonsai forest, bonsai forest planting, bonsai trees, Pennsylvania, Susquehanna Bonsai Club | Permalink.